Over the last couple of years I have made every effort to change my lifestyle toward a more environmentally friendly one. We recycle, use a old-time non-powered lawn mower. I don't use paper plates, paper towels, or any disposable plastic ware. I am conservative with my electrical use, unplugging, powering down and using power strips. I shop organic and local, with reusable bags. Like many of you I have also made an effort to buy less, donate or pass on the consumables that no longer work for my family. But somehow, I still feel like I can do more. So, today being Earth Day, is the perfect day to recommit myself to living more responsibly. And in the light of my experience this weekend, it is a necessity as well. I spent the weekend starting my spring cleaning. After throwing open all the windows to let the cool fresh air and fragrance of the season blow through each room, removing any winter staleness, I began my cleaning ritual. Dragging out all of the rags, dusters, cleaners, polishers, soaps, mops and such from underneath my sink, I organized all of the bottles in a pretty little basket to easily transport from room to room. After about an hour or two of serious cleaning, I began to cough, my eyes watered and my skin stung with irritation. Nothing I'm not used to. But it wasn't until Eleanor walked in the bathroom where I was on my knees and said "what is that smell." Then she coughed, and covered her mouth with her hand. "Yuck, that stuff makes me sick." At that moment, I realized just how many chemicals I am spreading around my house. These toxins are being absorbed by my daughter, our dogs, me and ultimately the earth. YUCK was right. So, I quit and began pouring over my stacks of magazines to see what suggestions or products I could replace all of those awful chemicals with. Of course I did not have to look to far or for to long, since every magazine you pick up has tips for turning green! Trying to sort through all of the "green" information is somewhat overwhelming. There are ways to go green for your home, your health and even your pets. But don't let the wealth of information stop you in your tracks. If you just focus on one area at time, like cleaning, it really narrows your search and breaks up the information into manageable parts. And I have to remind myself not to look at the ads, just the articles. Because the ads are just trying to sell you another product, not educate or inform or even provide you with a solution -- they just want you to purchase. So, I look for "tip sheets" or one page mini-articles of condensed information. 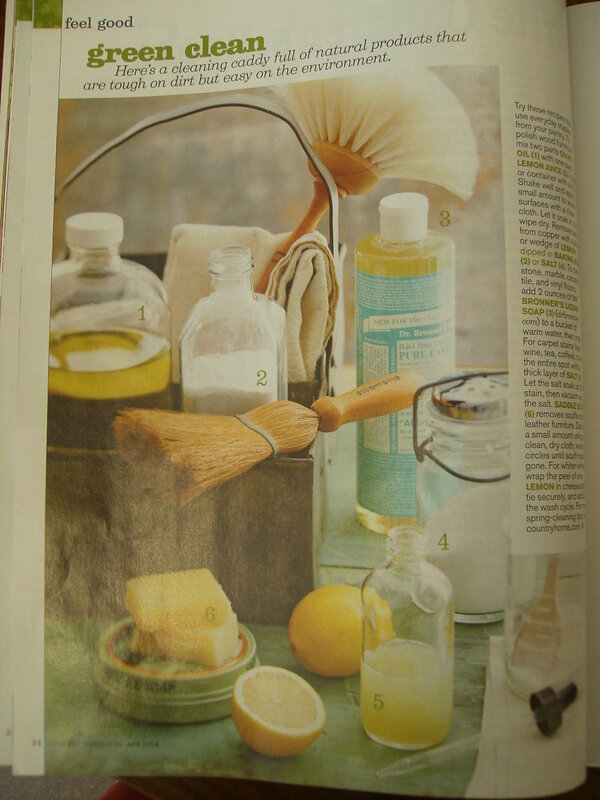 Like the simplicity of this month's Country Home's article on "Green Clean," featured here in the photograph, most of the remedies for green cleaning are direct and too the point. No explanation needed, just the recipe, what it is used for, and how to use it, are the only things listed. Gathering a couple of ideas from several sources, provided me with solutions that I could find right in my own pantry. So, there was no going out and buying new products to replace the 'bad' ones. I simply had to take a few moments to mix up a couple of different "cleaners" and I was back on track. Now my home is a cleaner, safer more environmentally friendly place. Hooray me, right? Well not really. I still have the dilemma of figuring out how to safely dispose of all of the toxic cleaners under my sink!